• For outdoor or indoor use • Durable recycled aluminum with antimicrobial protection Opened, it’s a notebook; folded, it’s a compact, protective box. Holds up to 30 forms. 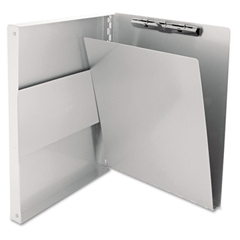 Hinged writing plate provides firm writing surface and prevents write-through. Holds forms to 8-1/2 x 12. 1/2" clip capacity.